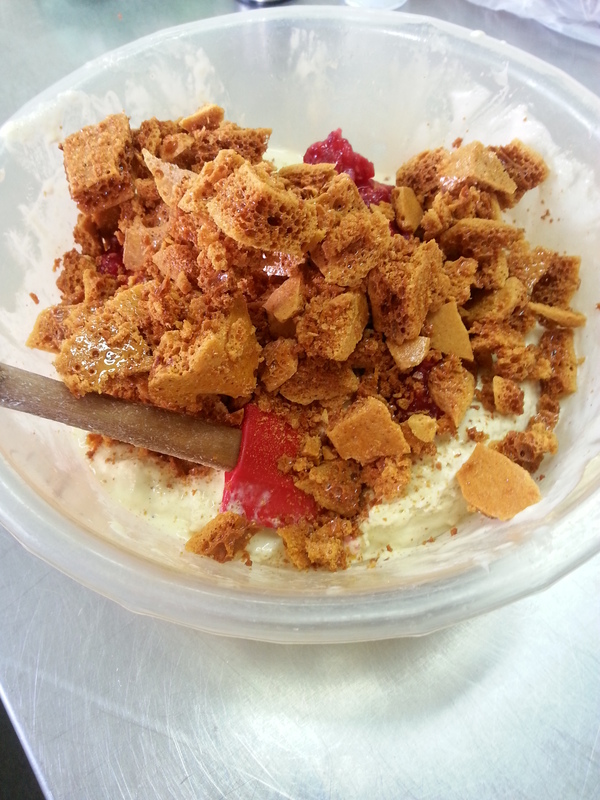 Heres a simple recipe for honeycomb, it may seem daunting but as long as your careful this will be easy (and safe). Ps. this can be used to make the recipe in my next post which all I can tell you it will include ice cream and caramel biscuits. Mix the sugar and golden syrup in a good large saucepan and heat, do not stir. Leave bubbling for 2-3 mins until the mix has turned a rich golden brown colour. Add the bicarbonate of soda to the pan and give it a quick mix, this will start bubbling and will be hot- be careful!!. Turn off the heat and carefully pour onto your prepared baking tray (if you want to take extra precaution you may want to wear your best oven mitts for this). Leave to cool over night, break up and enjoy. If you’re a fan of crunchies why not make your own by dipping your honeycomb pieces in melted chocolate and allow to set, or to take it up a notch put honeycomb onto skewers and make you own crunchie pops. hey thanks for liking my posts! Your recipes are wonderful! This looks great!